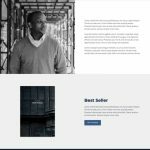 Finding the perfect WordPress theme is not an easy task. 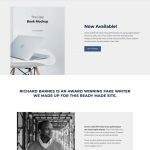 It might be even harder if you’re not a web designer but a passionate writer looking to have your own place on the web. Here’s where the following list comes in handy. 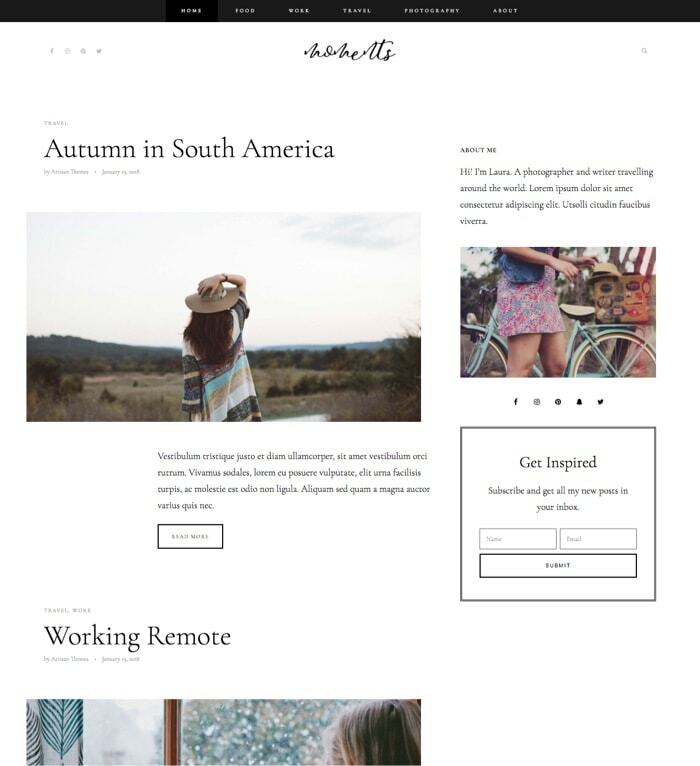 At Artisan Themes we design not just beautiful but also web-solver themes. What does that mean? It means having a useful tool to craft a professional website in the easiest and smoothest way possible. That’s why, in addition to the amazing features we pack in the themes, each of those comes with a collection of Ready Made Sites. 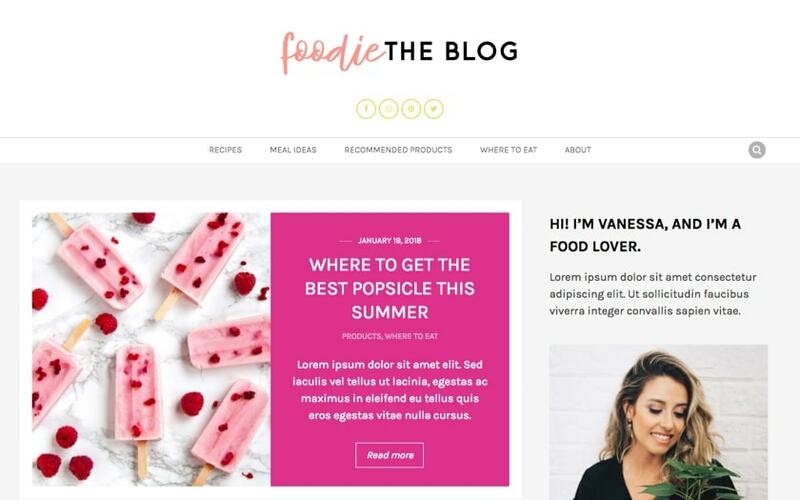 As simple as it sounds, these are sites built with our themes that you can install with one click from your WordPress dashboard. 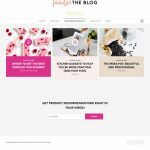 From classic and minimal to colorful and impressive, I handpicked for you 10 sites that you can install to have a beautiful and professional blog in minutes. 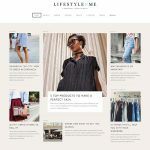 Saw a site that you like from this list? 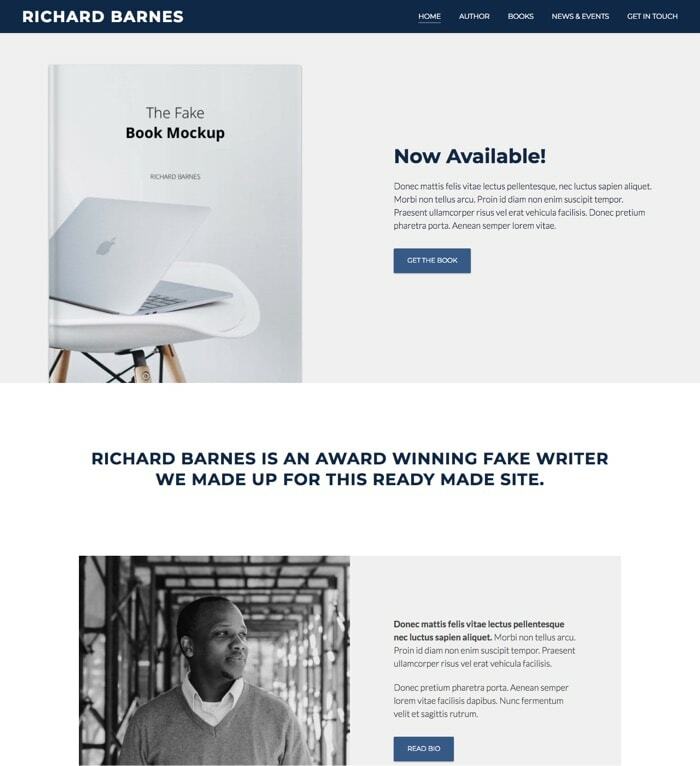 You simply purchase the theme it’s based on and you’ll be able to import it to your site right from your WordPress dashboard. 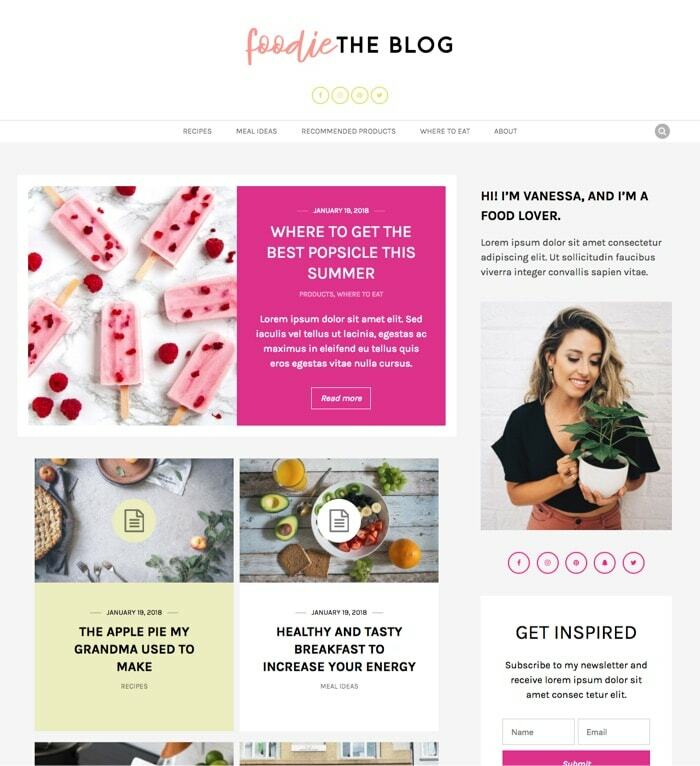 Get a beautiful blog and start sharing. The world is waiting for you! 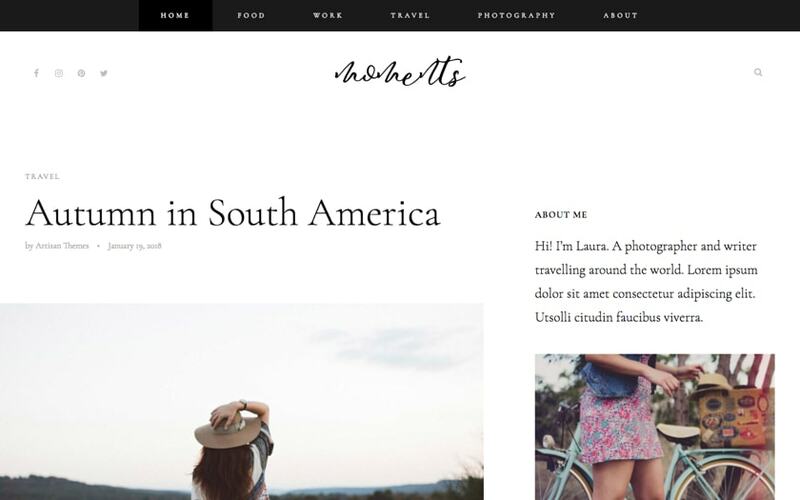 Moments is a minimal and chic blog for a passionate blogger. It’s based on Pepper+ WordPress Theme, so you’ll get all Pepper+ functionalities when installing this site. 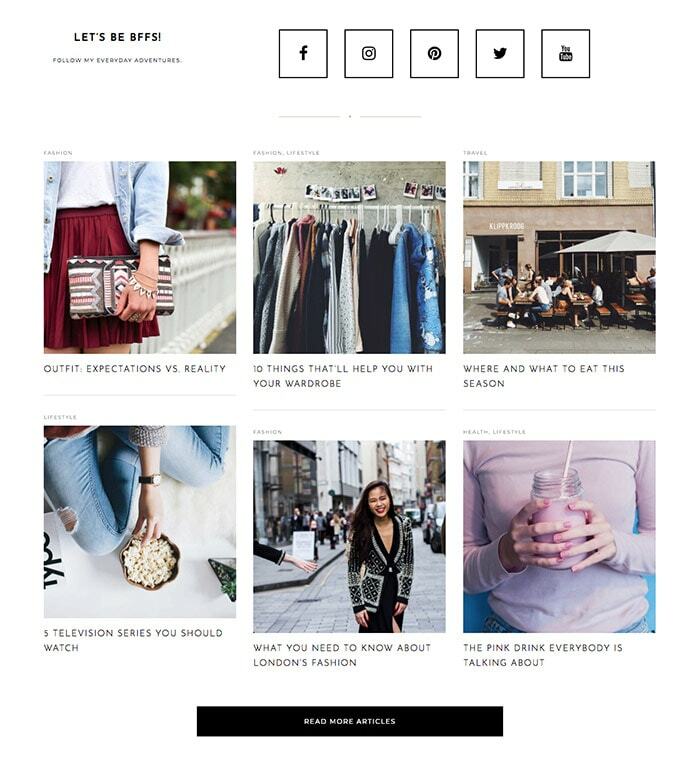 It’s suitable for any sort of lifestyle blog. 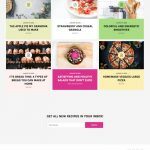 If you write about food, travel, health, fashion, work, home decor or photography, your content will look gorgeous and exclusive with Moments. This site includes 2 different homepages for you to choose, an about page and category pages. 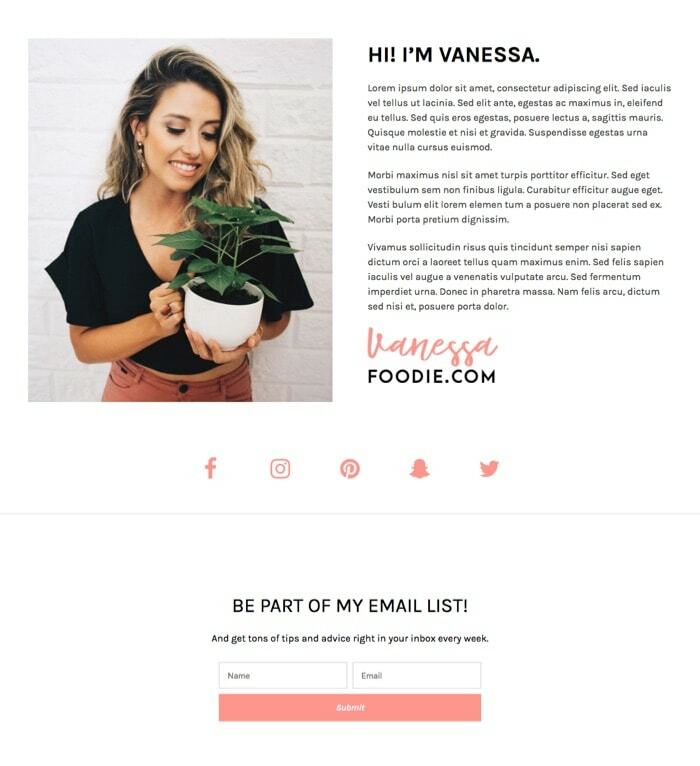 And it has a lead capture box that you can connect with Mailchimp or ConvertKit to start growing your email list. Just replace the content with yours and you’re ready to go out to the world. 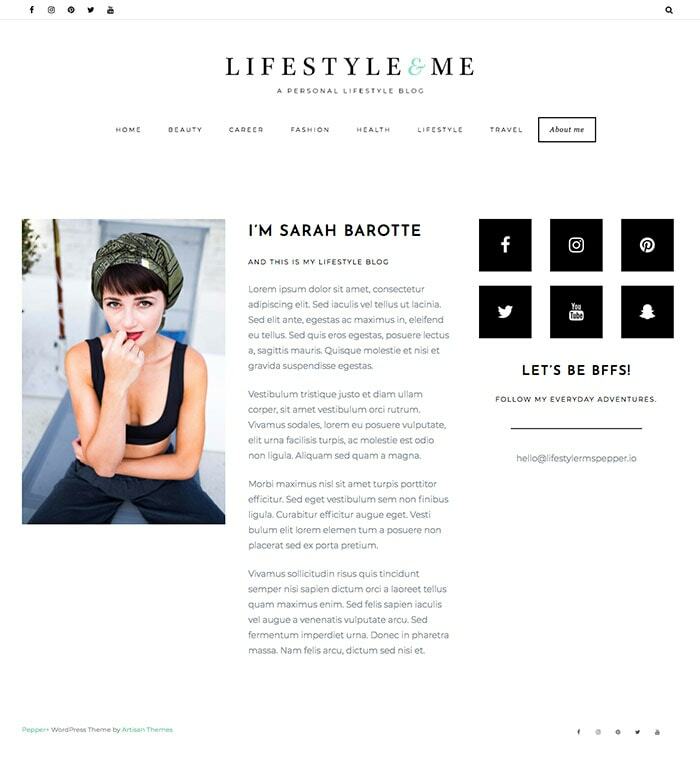 Lifestyle is both personal and editorial. 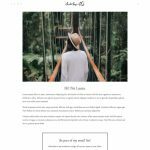 A fashionable blog or magazine for an exquisite author with an exquisite audience. It can serve any kind of prestigious publication website. 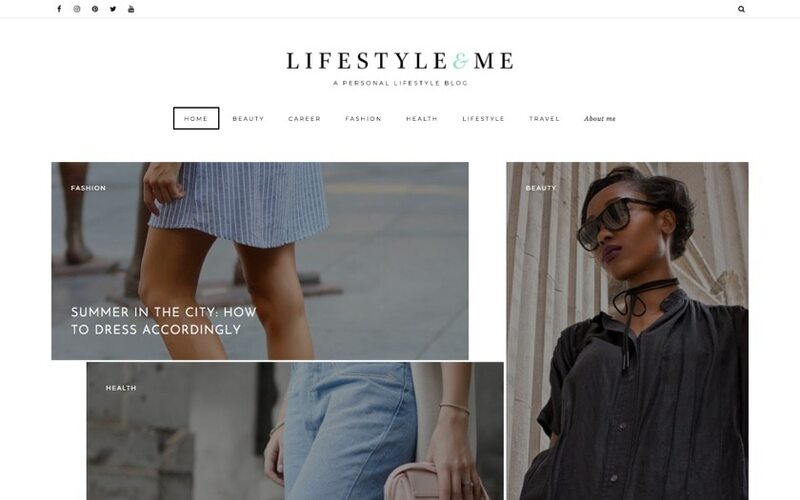 Including topics such as man’s fashion, news & politics, fitness, entertainment, health, food, travel, beauty, career, culture, books, technology, music and more. 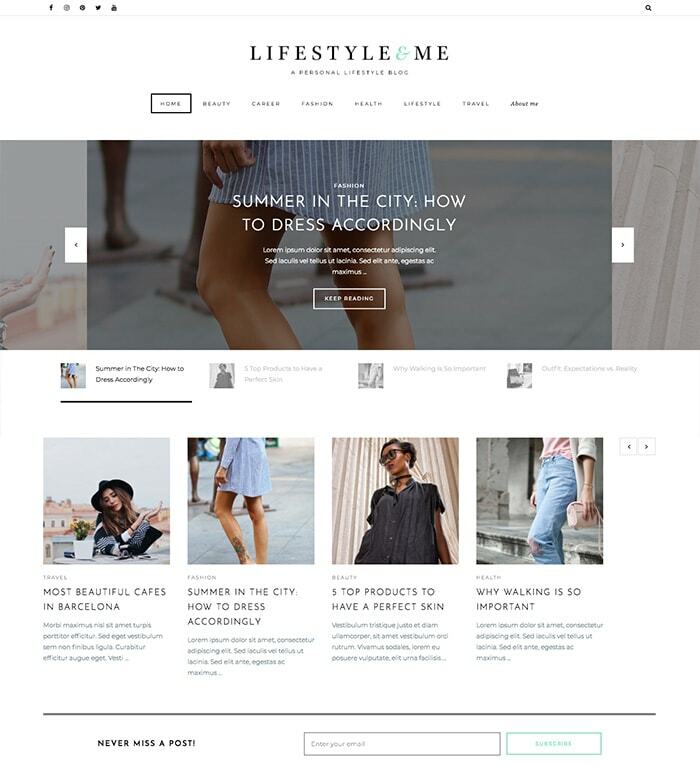 It comes with 4 different homepages to choose from, an about page and category pages that you can easily customize. 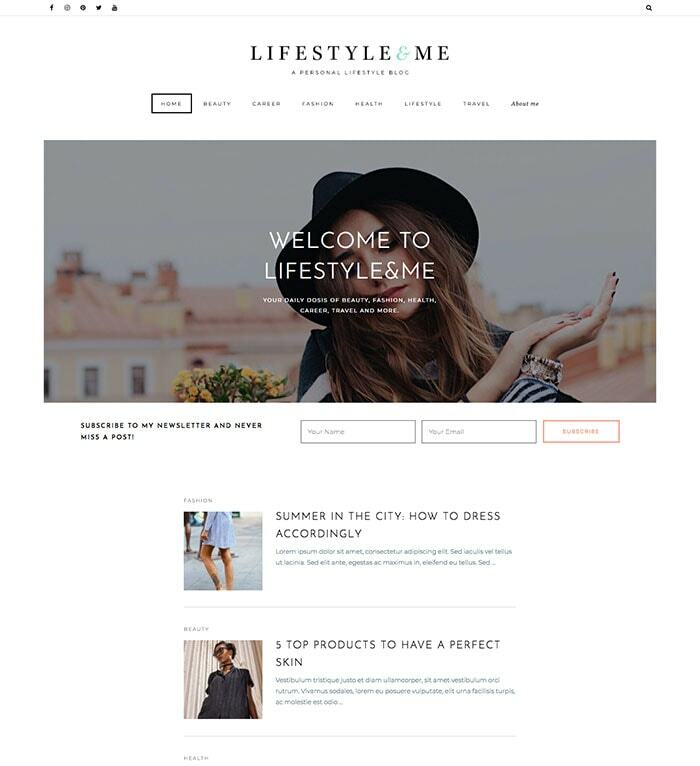 See more about Lifestyle here. 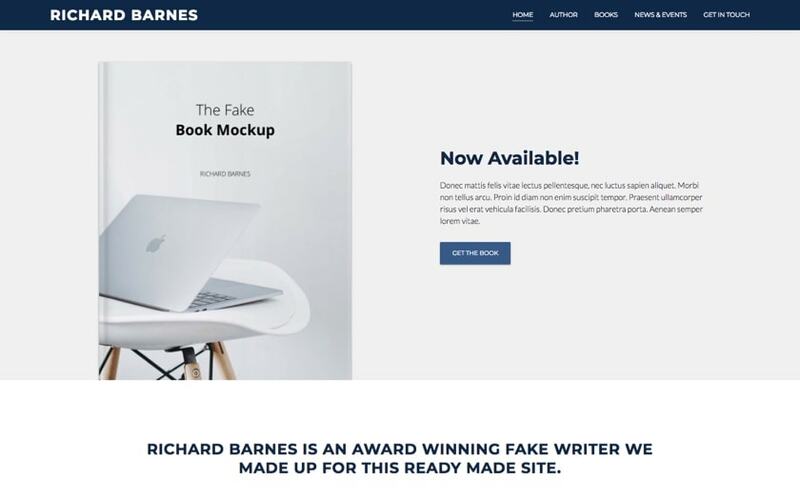 Author was created for those who need to present their publishing work in a solid and elegant way. 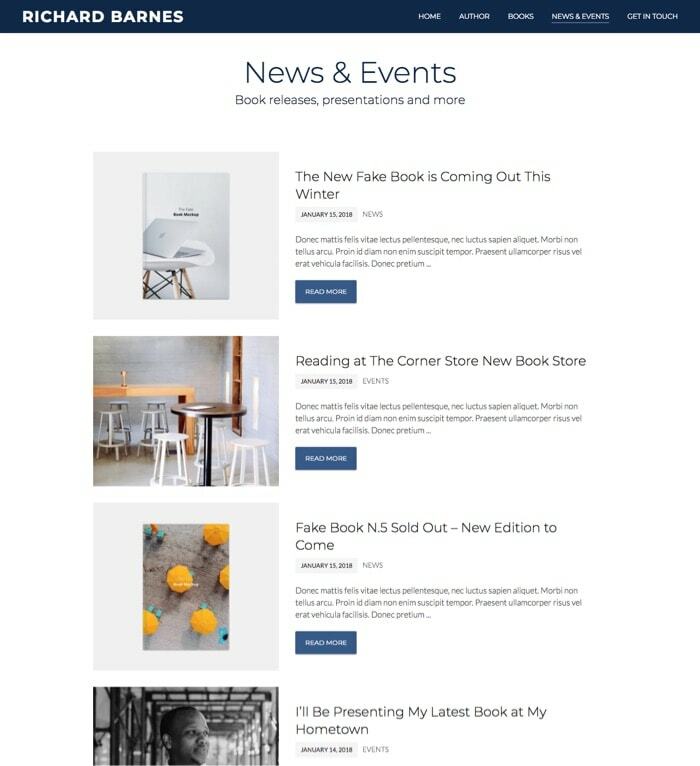 It features a neat Newest Work section on the homepage, followed by a short bio, a press quote, and info about other books, news and events. 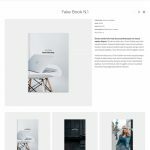 It also includes a full author page, a books catalog, a contact page and a news page, which you can customize in a breeze. 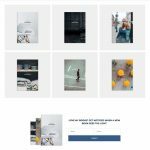 This elegant one-click-install site is based on Modules WordPress theme. By getting it you’ll get all the theme’s features. If you’re on the market for a more playful design, Foodie is the one you should pick. 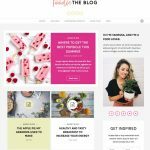 It’s a perfect match for a friendly blog that talks about food, recipes, parenting, babies, healthy habits and such. With a positive vibe and clean design. 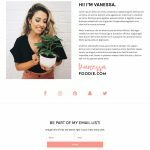 Foodie (actually, Binder PRO, which is the theme it’s based on) lets you choose a different color for every post so you can match every article to its content and imagery, and give your blog the mood you want. It includes a nice about page, category pages, and a beautiful homepage. 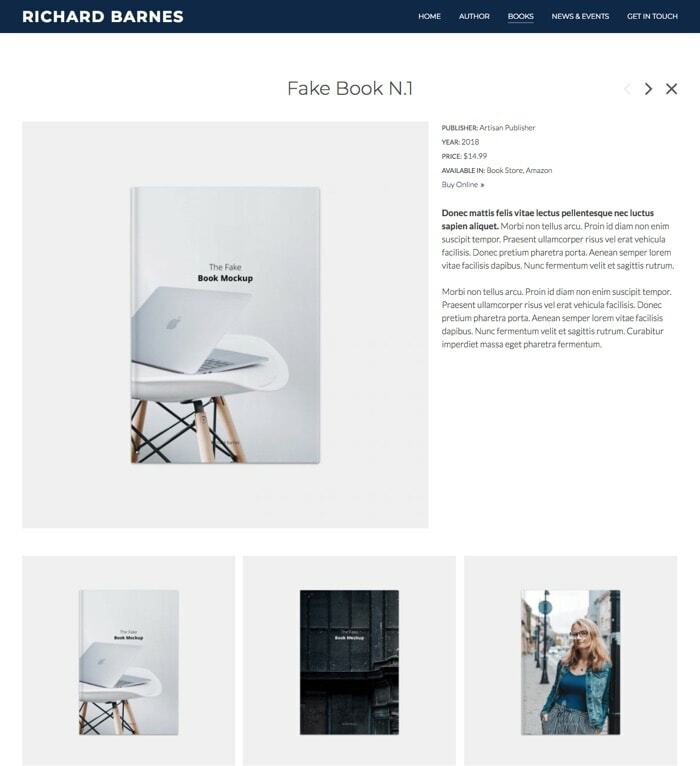 It’s based on Binder PRO WordPress theme, which is perfect for publishing sites. Young in spirit. Vibrant in ideas. 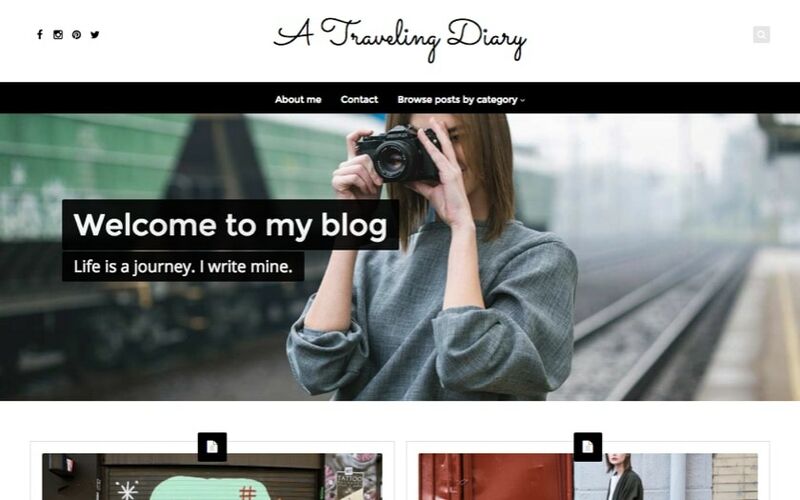 Diary is perfect for the traveler who is sharing the journey, whatever it is. 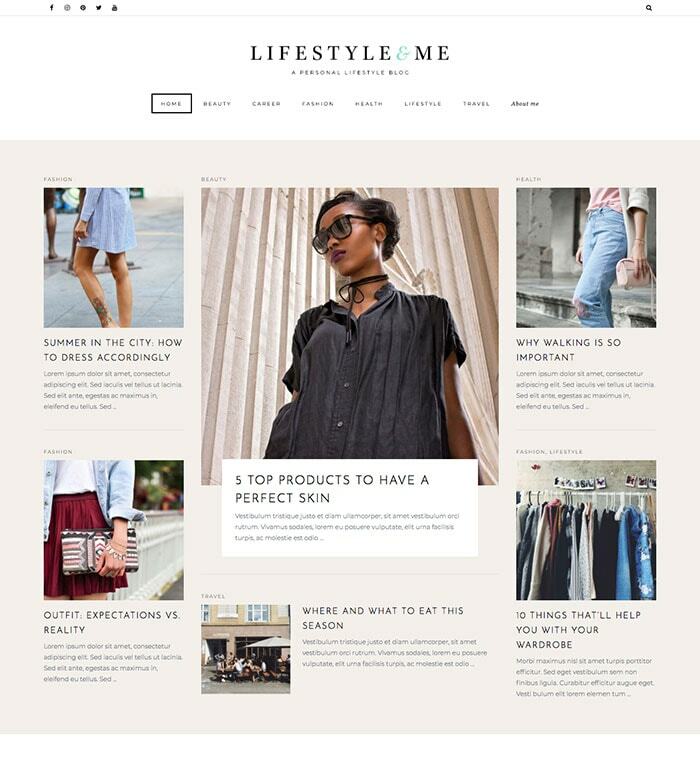 With a very personal style, features a masonry blog as a homepage, an about and a contact page. And includes a filter by categories for your visitors to reach all your published content. 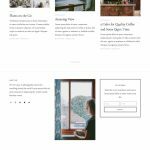 Diary is based on Nayma, a casual and bold WordPress theme for any purpose. 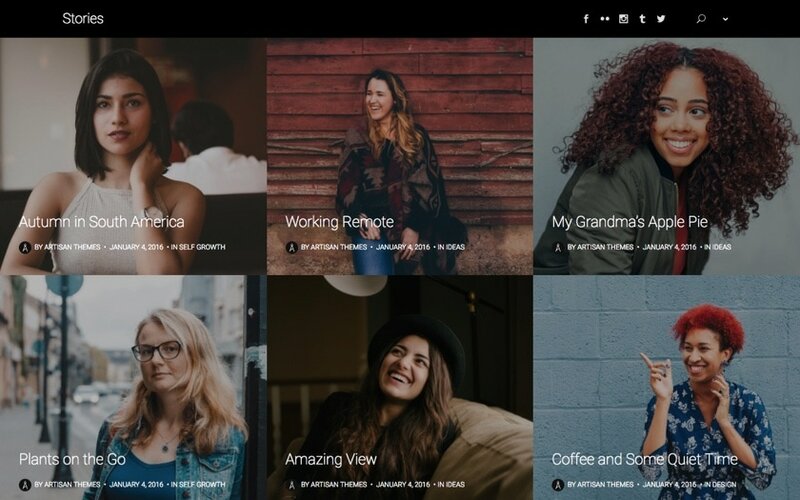 Start sharing your stories with Diary. 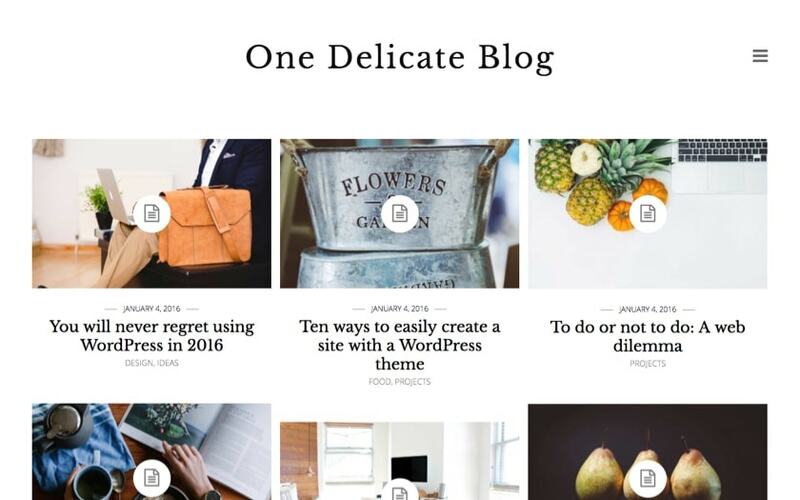 Delicate focuses on your content. whether it’s gardening, home decor, poetry, lifestyle or any other topic that requires a fine treatment, this design will do it justice. 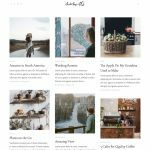 An elegant WordPress blog with a clean and delicate style that will definitely make you feel like writing. Includes a homepage with latest posts, two different About pages, a Projects page and a Contact page. 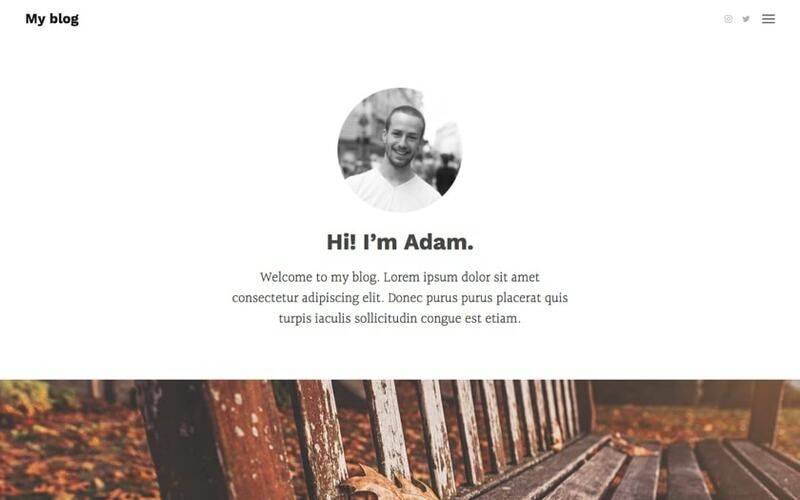 And it’s made with Binder PRO WordPress theme. Want to see it in action? Check it out here. 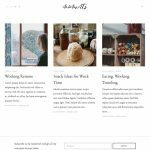 Journal is a straight-to-the-point personal blog built with Binder PRO theme. 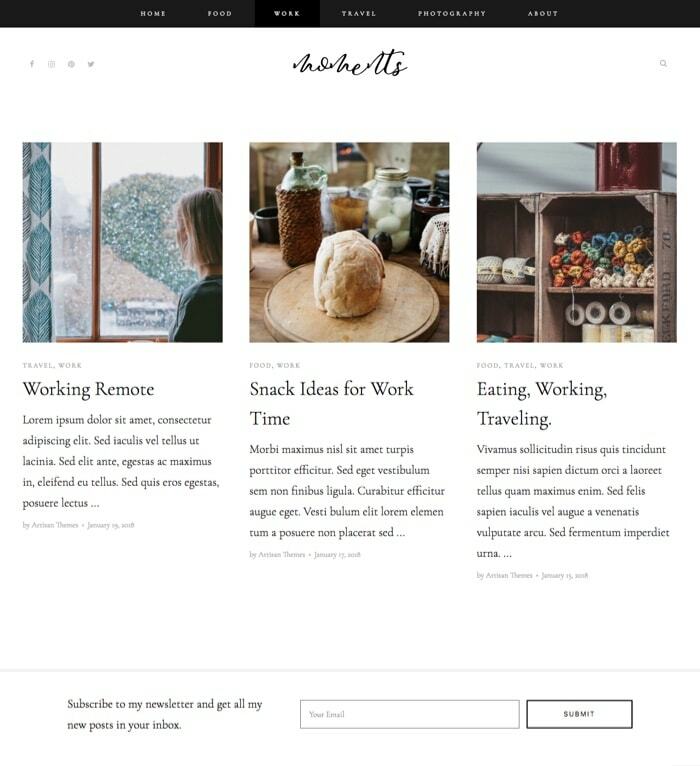 With a left-sided header, two different about pages to pick from and a masonry blog style homepage. 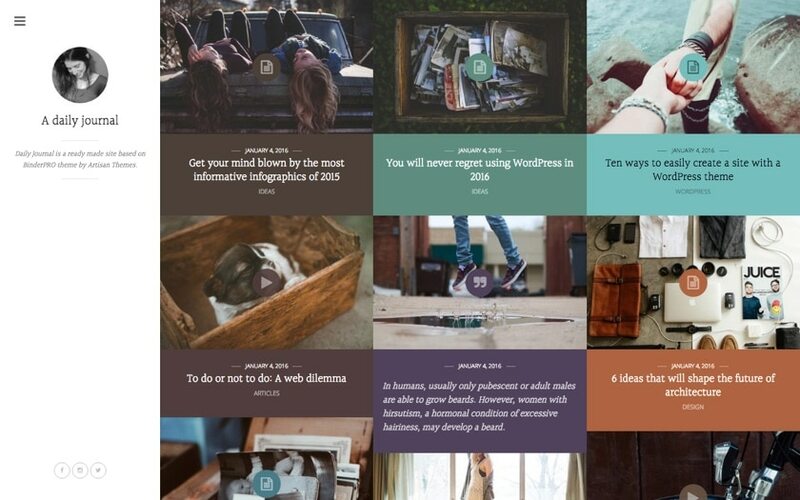 Cool tip: you can choose each post’s color and build a nice color palette on your blog page. It’s the perfect arena to let your inner thoughts see the light (the web light, of course). 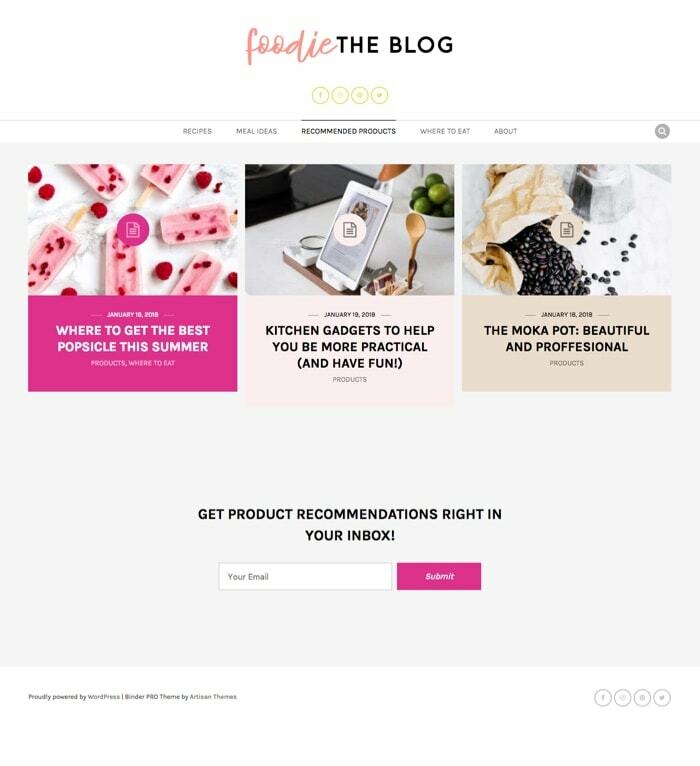 If you’re into a more classic blog style where each post gets its own personal space, Blog is the one to go with. 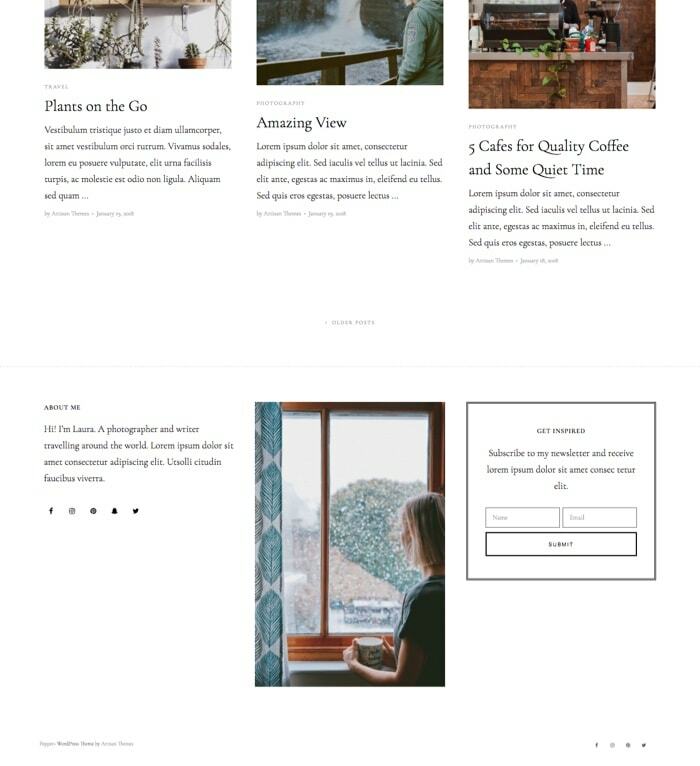 A Medium-like layout based on Indigo WordPress theme. Clean. Personal. Beautiful. An uncluttered space to tell your side of the coin. Where your writing is the star. 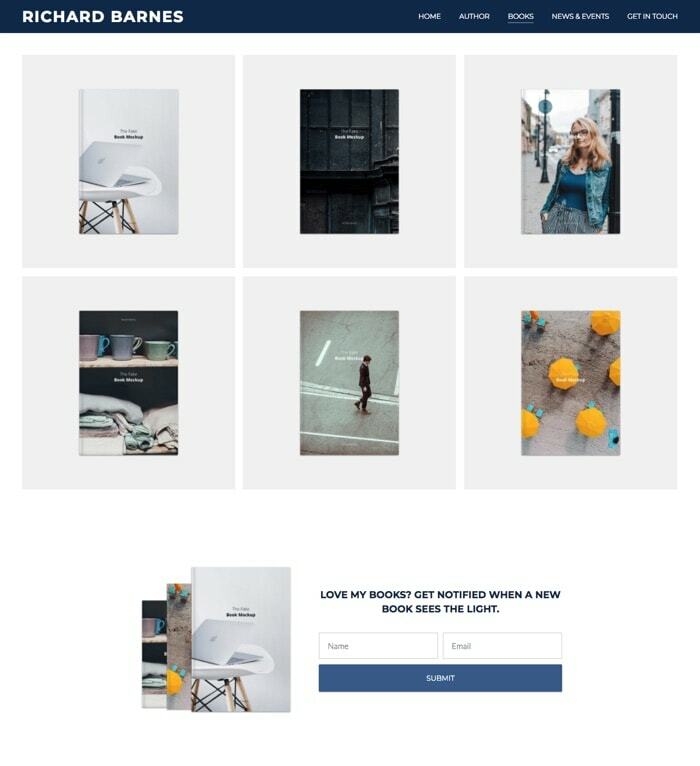 That’s all it takes: just a simple blog. Make it significant. 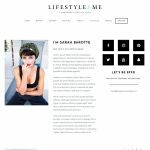 Similar to Blog, My Blog is also simple and clean. 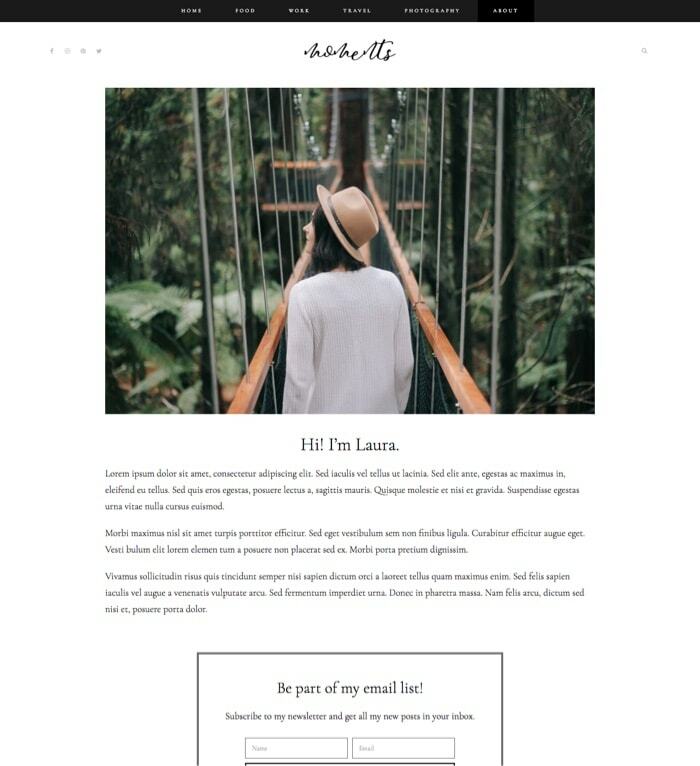 But this little one is based on Modules WordPress theme, and it includes 3 different homepages for you to choose from, plus a personal about page. Each homepage includes a brief description of the blog’s author to let the visitors know you better. Install this site and start writing your posts right away. View more of My Blog. 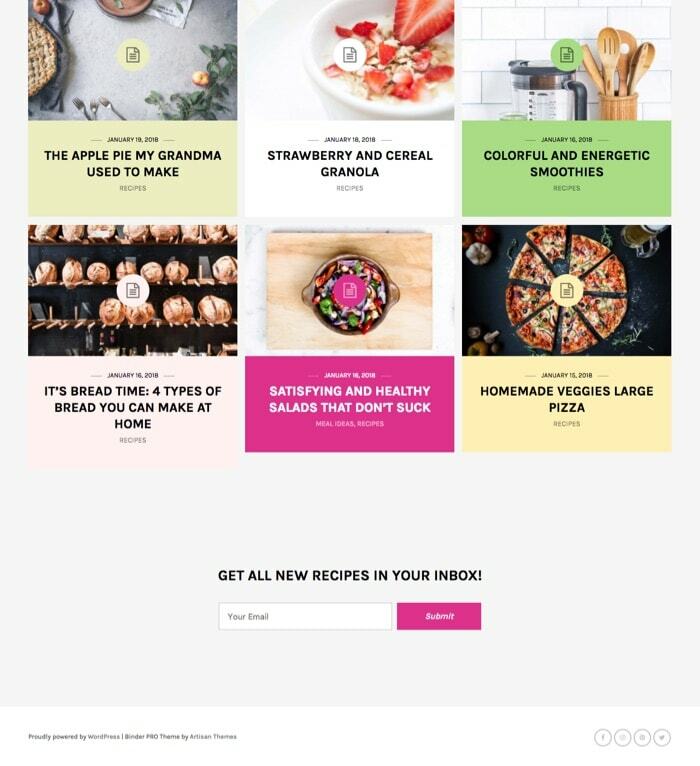 What if you have a special project you want people to know about? Like taking photos of people around the world and telling their stories, posting pictures of places you love with special memories, or even sharing your family members photos with each one’s biography. 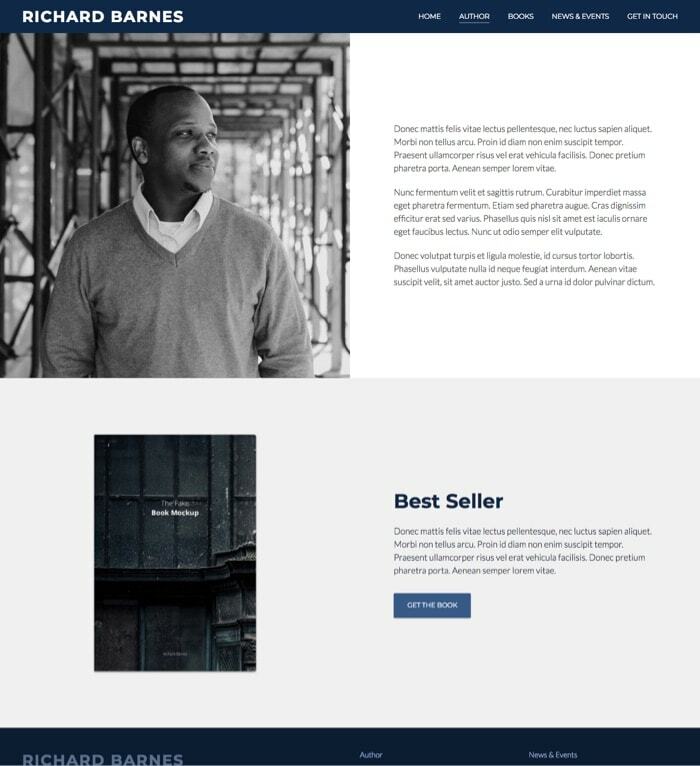 Well, Stories is the perfect fit for that: a site for a storytelling project. 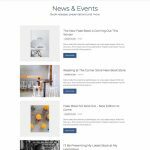 Based on Indigo WordPress theme, it will automatically arrange your posts in a web-card fashion giving your visitors immediate access to the whole content. Imagery is key for this design. Make sure you have good quality and special photos to go along with your stories. 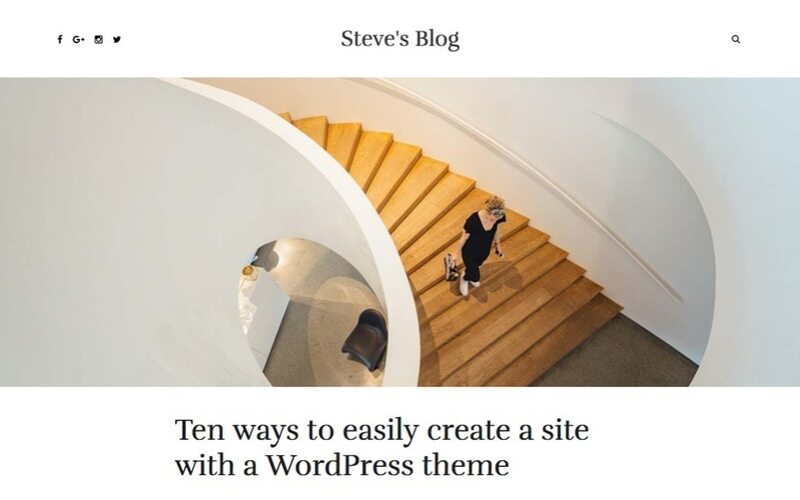 You can automatically install any of these sites into your WordPress site with one click. And then begin writing your own content. 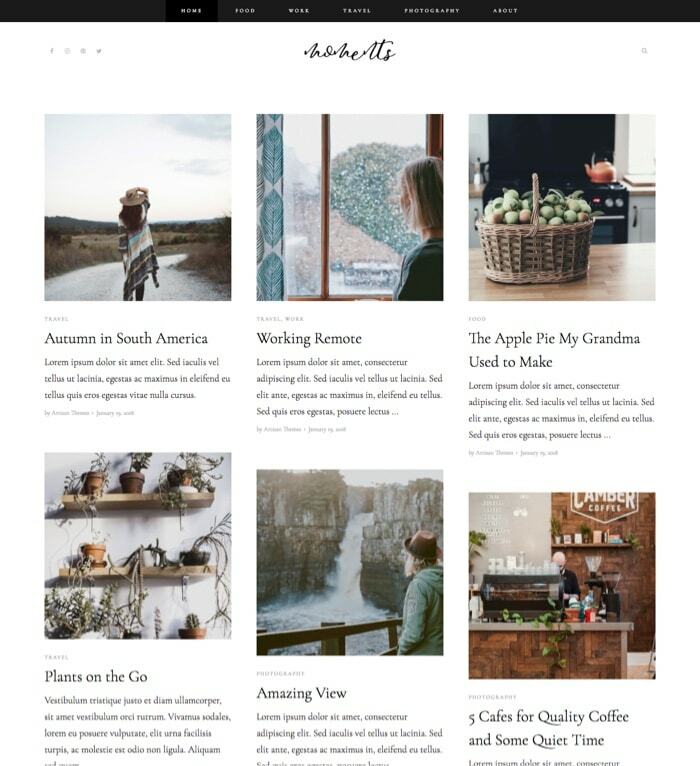 Get the site you like by purchasing an Artisan theme and start sharing with the world what you’re passionate about.